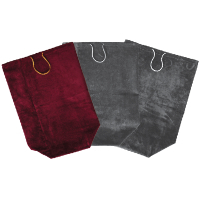 Velveteen bag for wood ashes (single) casket. Plain as standard, but can be embroidered with company name or logo. Dimensions (in cm): 22 x 19(W) x 44(H). Colours available: Maroon, Blue and Green. Up to 2 lines of Gold embroidered text on our velveteen bags. Price shown is for standard lettering - excessive lettering may incur additional costs.